Thus, as an alternative, transmitters with current or voltage signals can be connected on the same instrument. Using the transmitter power supply, current loop sensors (2-wire) as well as 3-wire and 4-wire sensors can be operated. The transmitter power supply is galvanically isolated from the measuring input. Two alarm outputs are available. 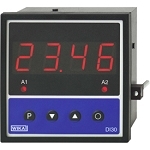 In addition, the indicator offers the possibility for sensor calibration and linearisation of up to 10 points. This makes further adaptation to different sensor signals and application requirements possible. The standard features are completed with the adjustable sampling and display rates, and the input offset, for correcting zero offsets and sensor drift. Similarly, functions such as HOLD and TARE are included. Unauthorised alteration of the set instrument parameters can be prevented via different user levels, in conjunction with a freely-selectable access code. All configuration and programming can be carried out through the front-panel keys.